Deb Lindner has been a housekeeper at Kendal at Oberlin for 14 years. 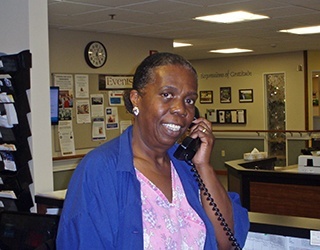 As she cleans apartments in the Stephens Care Center, she chats with residents, sharing stories and answering questions. “I know every single resident like I know my own grandmother,” she says. Working in resident’s homes means she sometimes sees things that might be of concern to the nursing staff. “We might be the first ones to find them if they fall or see a potentially dangerous situation, like a glass vase on the edge of a table. The nursing staff is 100 percent receptive. We’re one big team,” she says. Deb gets to know family members, too. One of the hardest jobs for family is cleaning out the apartment after their loved one dies. Deb is quick to point out that Kendal’s Resale Shop will take donations of furniture, household items and clothing – even pick up the donations. Family. A team. My favorite job. Talk to a cross-section of Kendal employees and you will hear these themes repeated as they share heartfelt stories involving co-workers, residents and families. 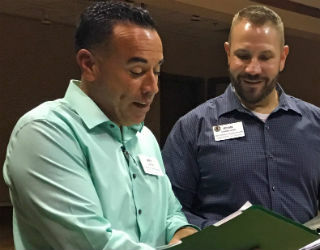 Competitive wages and benefits, including health and life insurance, a retirement savings program and use of the pool and fitness center are also reasons people like working at Kendal. The staff of 232 men and women is diverse, ranging in age from 16 to over 70, with almost 20 percent minority representation. The workforce has deep roots; 20 percent of the staff have worked at Kendal 15 or more years. Electrician Jon Hall started working at Kendal just before it opened its doors in October 1993, and he was on hand to help residents move in. Over the years, he’s seen the community change in size and shape. The campus and cottages have been remodeled to reflect the needs and wishes of today’s retirees, such as expanded living space and a state-of-the art fitness center. But one thing hasn’t changed. “It’s a community, like an extended family,” he says. For Jon, the perks of the job are numerous. He bikes 10 minutes to work every day and works out in the fitness center almost daily. He is a frequent customer at the Resale Shop and has bought four cars from its car donation program. Even his parents, in their late 80’s, are Kendal fans. They are on the Priority List, but for now are content to live in their Oberlin home. His father likes to figure skate and stops by Kendal to pick up residents. Between his parents and Kendal residents, Jon has a positive attitude about growing old. “You have to keep mentally and physically active,” he says. Barbara Thomas joined Kendal the year before it opened, and the chief executive officer still finds the job full of awe and adventure. “What I love about Kendal is that no two days are alike, offering continual exposure to new things emanating from our residents, staff and external partners. 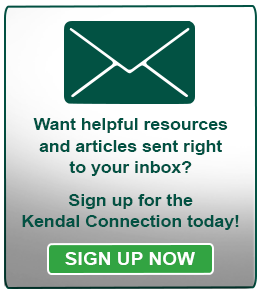 It makes Kendal a great place to live and work,” she says. The community has two dining rooms, offering an assortment of fresh, healthy and affordable meals for residents, staff, family and friends. Not only is the job close to her home, but she said the flexibility was a draw, too. “It’s always been convenient for a school schedule, and I could request certain days off,” she says. 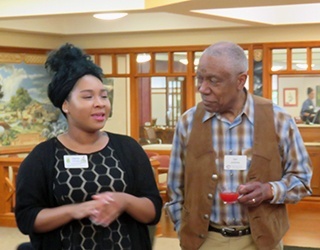 This spring, Taiya graduated from Oberlin College, and Kendal held a reception in her honor. Along with staff and residents, a representative from Oberlin College came to welcome Taiya to the Alumni Association, a distinction shared by many residents. “Always the question from residents – what are you going to do?” she laughs. The 22-year-old plans to work another year at Kendal while she contemplates graduate school, possibly in criminal justice. The general reaction from residents? “Oh, that’s good,” she says. Monica Fuquay, a native of Medellin, Colombia, has worked as a server since 1999 in the Langston dining room, which is open all day. “Serving is my passion. I love opening the doors in the morning for breakfast and seeing the residents. Eating is important to them, and they want to eat well. I need to do my best for them. I don’t want my residents to have to wait. I know I could make more money as a nurse’s aide or doing some other jobs at Kendal, but I don’t want to do something that is not in my heart,” she says. When she’s not working, she can often be found at Kendal, working out in the gym or walking around the campus. One of her favorite activities is attending the weekly Spanish language table. “I learn every day from the residents. They give me inspiration. The way they deal with all the loss, it’s amazing. I don’t see them grumpy, angry or complaining about being in pain. Every morning when I ask one of the residents ‘How are you?’ he replies, ‘Vertical.’ I love that. Angels, that’s what they are,” she says. Night nurse manager Tanya Phillips remembers her first impression of Kendal. 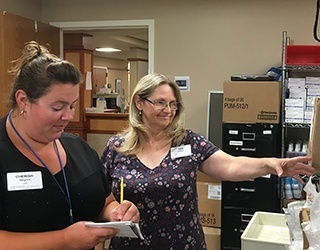 “From the first moment I entered this facility, what most impressed me was that as I walked the hallway to my interview destination, there was not a single person I passed – resident or staff – who did not greet me with a ‘hello’ and a smile,” she says. Ten years later, Tanya is still impressed. “I most appreciate the opportunity to interact on various levels with residents through good and bad times, healthy and declining times, and the lifelong relationships created with families. “I am extremely blessed and thankful for the night shift employees that work with me. We are as much a family who depends, supports and gains strength from each other. We are truly a team,” she says. A couple years ago, Tanya’s team came together to talk about their grief at the death of numerous residents, some of whom had been founding residents. The night staff decided to start a quarterly newsletter, titled Heartstrings, to share memories, comfort food recipes, grief support meetings and other helpful information. Last year at its annual conference, LeadingAge Ohio recognized the Heartstrings staff with its Excellence in Service Award. LeadingAge also recognized Kim Preston with a $1,000 scholarship to help with tuition for a nursing degree. Kim has a Masters in Bioethics from CWRU’s Medical School with a focus on end-of-life decision making and has been a member of Kendal’s Social Services department since 2000. Facility Services Director Rey Carrion has been on the move since he arrived at Kendal three years ago. In addition to supervising a staff of 15 people who are responsible for the 100-acre campus and 500,000 square feet of building, Rey oversees capital improvement projects, including a multi-year plan to renovate all cottages and apartments. “When I read the job description I thought, ‘This is me!’ My first contact was a phone interview with Human Resources Director Toni Merleno. We talked for an hour and a half, and I could sense her care and compassion and how she values people. The more I talked to her, the more I was being drawn to Kendal. It sounded like a wonderful place to work. When I drove up to the front gate for my interview, I was immediately impressed, the ‘wow’ factor, and as I drove around, I could see the pride in the community. The way people greeted me was so positive, I knew Kendal had high standards,” he says. Wellness Coordinator Jill Tvaroha has many roles – fitness instructor, personal trainer, Reiki practitioner, certified pool operator. She even has a Commercial Driver’s License so she can occasionally transport residents in the 18-seater van. “Based on feedback from our residents, we are really moving toward wellness, using a holistic approach. Our classes are geared toward working hard and having fun, and we are mindful to include components specifically needed and requested, such as balance, coordination, endurance, strength and flexibility,” she says. Jill says working with older adults in a community based on Quaker values has changed her perspective about life and how she lives. “If you listen, there’s a huge knowledge base here about what’s important and how to live your life fully. I feel so grateful to be working in a place where I am receiving so much and am able to give from the heart and make a difference in the lives of other people.” Jill says. Take the opportunity to meet our staff and residents by scheduling a tour. Call 800-548-9469 or 440-775-0094 or visit us online.